Britain may lose the magic of the Northern Lights by the middle of the century due to major shifts in solar activity, scientists have discovered. Space scientists at the University of Reading conclude that plummeting solar activity will shrink the overall size of the sun's 'atmosphere' by a third and weaken its protective influence on the Earth. This could make the Earth more vulnerable to technology-destroying solar blasts and cancer-causing cosmic radiation, as well as making the aurora less common away from the north and south polar regions for 50 years or more. Dr Mathew Owens, from the University of Reading's Meteorology department, led the research. He said: "The magnetic activity of the sun ebbs and flows in predictable cycles, but there is also evidence that it is due to plummet, possibly by the largest amount for 300 years. 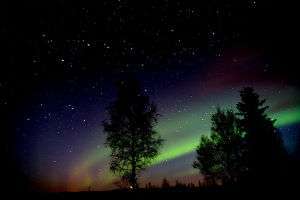 "If so, the Northern Lights phenomenon would become a natural show exclusive to the polar regions, due to a lack of solar wind forces that often make it visible at lower latitudes. "As the sun becomes less active, sunspots and coronal ejections will become less frequent. However, if a mass ejection did hit the Earth, it could be even more damaging to the electronic devices on which society is now so dependent." The study, 'Global solar wind variations over the last four centuries', published in Scientific Reports, shows how sunspot records can be used to reconstruct what happened the last time the Earth experienced such a dramatic dip in solar activity more than three centuries ago. Combined with updated models and contemporary reports, the researchers were able to predict what could happen during a similar event, likely to occur in the next few decades. The scientists believe the coming 'grand minimum' could be similar to the Maunder Minimum of the 17th century, when sun spot activity almost stopped – another symptom of a less active sun. Solar wind, made up of electrically charged particles from the sun, travels at around a million miles per hour. A reduction in solar wind would see the heliosphere – the 'bubble' around the solar system maintained by particles emitted by the sun – shrink significantly. This protective bubble helps shield the Earth from harmful radiation from outer space, but has weakened since the 1950s. The scientists predict a rapid reduction in the bubble's size by around the middle of the 21st century. The Earth's own magnetic field deflects some of this radiation, but areas close to the north and south poles are more vulnerable where the Earth's magnetic field is weakest. Co-author Professor Mike Lockwood FRS, University of Reading, said: "If the decline in sunspots continues at this rate, and data from the past suggests that it will, we could see these changes occurring as early as the next few decades. "The Maunder Minimum in solar activity of the 17th century is sometimes mistakenly thought to be the cause of the so-called Little Ice Age, when winter temperatures in Europe, and elsewhere in the world, were lower than average. "But the Little Ice Age began before the Maunder Minimum and ended after it, and our previous work with the Met Office has shown that the coming solar minimum will do little to offset the far more significant global heating effects of greenhouse gas emissions." I've never seen the aurora from Britain at ~50 degrees N. However, I did once see the Aurora Australis from NZ, at ~37 S. Must have been a particularly impressive CME. Pure conjecture. If the MM wasn't the cause, what was then?